A few weeks ago, my husband and I had several house guests. 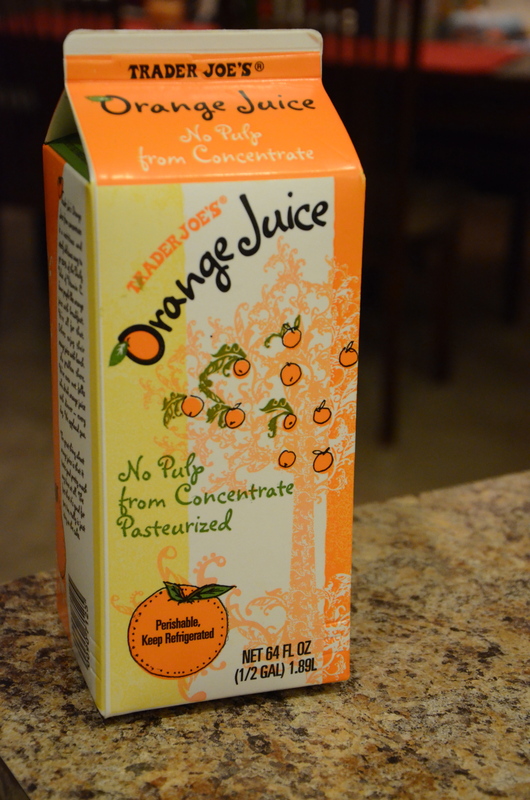 I seem to recall a time in the past when these guests asked about orange juice in the mornings, and I didn’t have it, so halfway through the weekend I came home with a half gallon from Trader Joe’s. Alas, when the guests departed, hardly a glass had been consumed, and I faced an abundance of juice that I rarely drink and Matt never does. Over the course of a couple of weeks, I used the orange juice to make Orange Muffins, Cinnamon-Orange Juice Cake (a delicious coffee accompaniment that resembled a doughnut in cake form) a marinade/sauce for pork chops, and the recipe I am featuring today, for an Avocado Banana Smoothie. All of these recipes would certainly have tasted better with freshly squeezed orange juice and orange zest incorporated, but I was content to “cook” almost exclusively from what I had on hand. I just realized that my mantra should probably be: “when in doubt, bake it into a cake or blend it into a smoothie,” because I have previously used excess produce to make things like beet cake and avocado pound cake. Back to the food. This recipe was adapted from a recipe from Martha Stewart’s Everyday Food and influenced by Marcus Samuelsson’s recipe for an Avocado Banana smoothie. Drop solid ingredients into a blender and then pour liquids on top. Blend until smooth. Serve immediately. In honor of St. Patrick’s Day, enjoy this liquid green goodness! This entry was posted in Orange Juice, Recipes. Bookmark the permalink.